Owen Sheers is a poet, playwright, and novelist. He has worked with British war veterans producing a play retelling their traumas. His latest novel, I Saw a Man follows the healing process of Michael Marshall widowed when his journalist wife is killed on assignment in Pakistan. 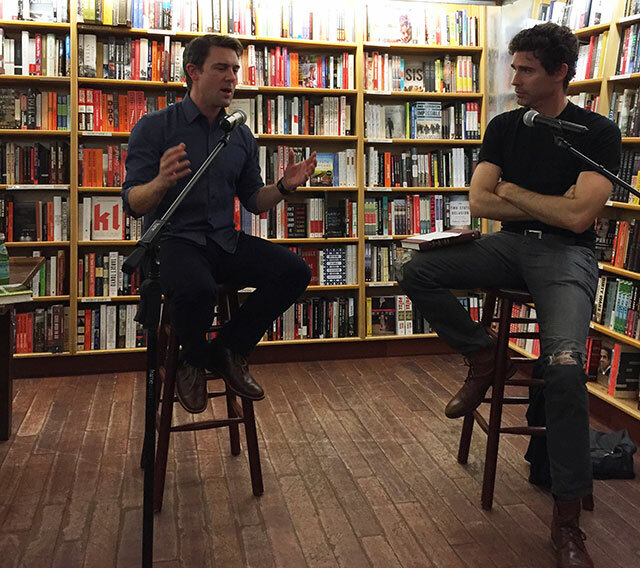 He discussed the novel at McNally Jackson Books with Joshua Ferris, author of To Rise Again at a Decent Hour. The novel’s protagonist Michael enters his neighbor’s house, uninvited. Sheers says he wanted to know what it would be like to open a novel with suspense–what does that allow him as the writer to get away with. The trespass was intended to serve as the spine of the first half of the novel. The result, Ferris says, is that Sheer’s has written a literary novel bordering on a thriller. The novel is an examination of the psychological hinterland. Michael endures the suffering of grief created by the amputation of love. He grieves both for his wife and for the man he could have been with her. Sheers says he has never had to grieve the way Michael has. “Grief is the rough underside of love,” he says. To deal with the grief, Michael sells the house in Wales and moves to London. There he needs to avoid some places out of sadness, but tries to hold onto his routines as that is all he has keeping him together. The novel also follows Daniel, a drone pilot in the United States responsible for killing Michael’s wife Caroline. Like Michael, Daniel follows routines. Because he flies drone missions remotely, his life is divided between bombing people and living with his family. Ferris says that Daniel feels very guilty–he feels responsible. “Evolutionarily we cannot keep pace with technology,” Sheers says. PTSD is higher among drone pilots, Sheers says, because they have close up images of the people they are killing. He created the character of Daniel from interviews he conducted with drone operators. In some ways, front line combat troops find it easier to adapt than drone pilots. The line between adrenaline fueled battlefront and domestic homeland is clear. For drone pilots, they confront those two worlds several times a day. Sheers says that the juxtaposition between tucking in your kids at night and fighting a war is tough to adapt to. He was interested in the anxiety of proximity and distance. Writing the novel was no easy task. It took seven years and the first ten thousand words were written three different times. Each of those were thrown away. Sheers says the trouble was he was searching for authenticity. He wanted it to be contemporary novel in every sense of the word. Characters distill themselves over a long period of time. Eventually, when Sheers found the voice and the authenticity he wanted, he was able to write out the first draft of the novel in three months. “The demands you have on yourself as a writer are often unreasonable,” Ferris says. Sheers says that had he not had other projects to work on, he never would have finished the novel. The other projects satisfied the need to complete things. The words that are discarded are as much a part of the book as the ones that are kept, Sheers says. For a long time, Sheers says he had an anxiety of contribution. He worried about what he was accomplishing with the book. Eventually the theater project crossed his path where he interviewed soldiers. He spoke with soldiers injured physically or psychologically and produced a theater piece based on those biographies. The process helped shaped the character of Daniel. In some sense, the book is built around accidents without any true villains. Daniel, for instance, sets the plot in motion by accidentally killing Caroline. One reason to read and write novels is to find moral complexity, Sheers says. There are no good or bad people.